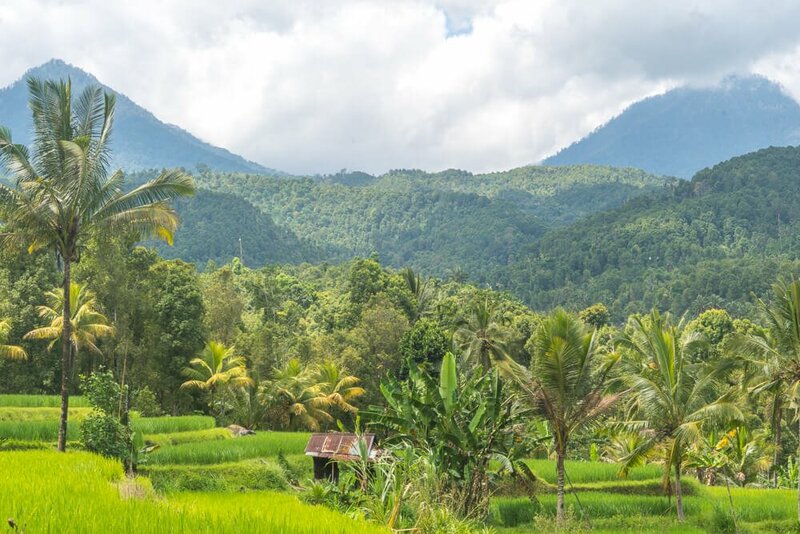 One of our favourite spots in Bali, Indonesia, is the beautiful village of Munduk, which is found in the mountains of the Central Highlands. It’s a small village with a more authentic feel to it than the busy tourist areas like Ubud, making it a perfect addition to any Bali itinerary. Despite being a small place, there are plenty of things to do in Munduk and the surrounding area. 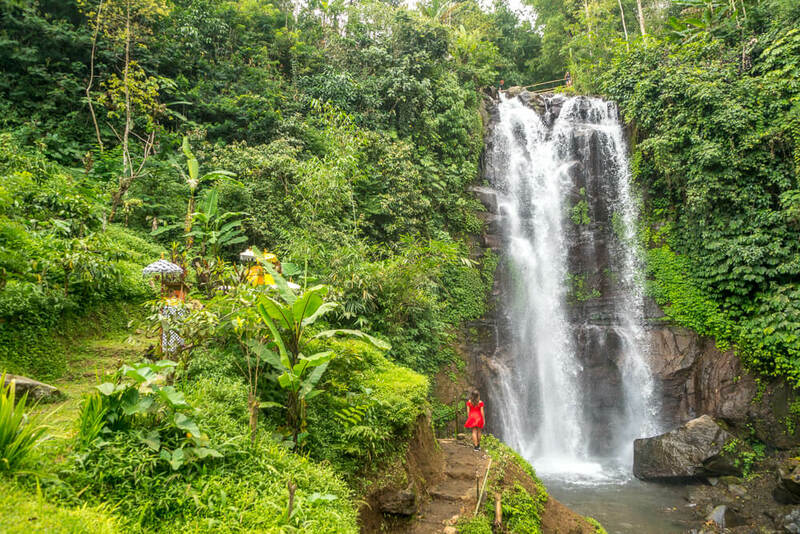 It’s a wonderful place for any nature lovers in Bali, with 3 stunning waterfalls to see on the Munduk waterfall trek as well as a number of places to visit on day trips and tours around the area. This travel guide covers the best things to do in Munduk, Bali, as well as everything else you need to know about visiting! Find out everything you need to take on your trip with our Bali packing guide! It covers product recommendations, ways to save money and more! 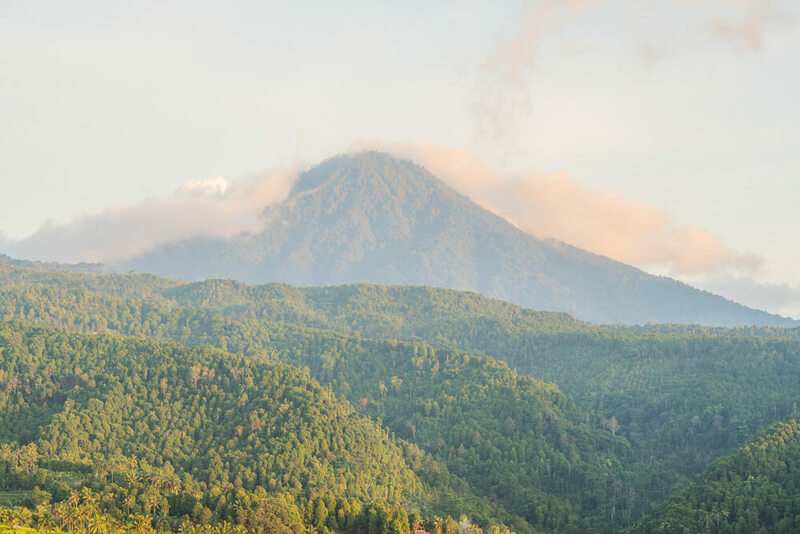 Munduk trekking – One of the best things to do in Munduk is go trekking as the area is home to some of the most beautiful nature in Bali. The most popular trek to do is the Munduk waterfall trek, which takes 3-4 hours and leads you to 3 different waterfalls – Laangan Melanting waterfall, Red Coral waterfall and Golden Valley/Munduk waterfall. This lovely hike through Munduk is easy enough to do without a map, and leads you through the wonderful nature Bali has to offer. Click here to read our guide to doing the Munduk waterfall trek! There are a number of other walks to do in the area too, whether it’s through the rice fields or to smaller waterfalls near to the village. To see the best bits you may want to consider paying for a guide to take you on a day trek around Munduk. Munduk swing viewpoint – A recent addition to the sights to see in Munduk is the swing viewpoint at Wanagiri Hidden Hill. 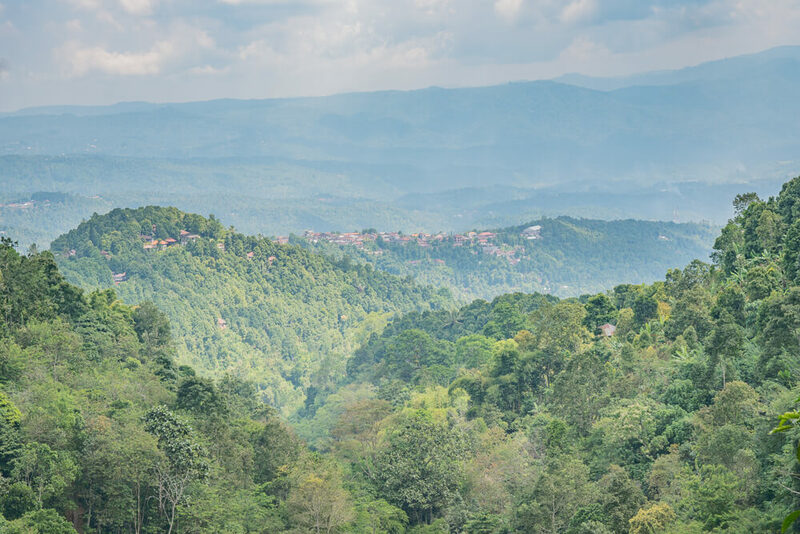 Locals have created structures and swings with views overlooking Munduk as well as the twin lakes of Tamblingan and Buyan. It’s one of the many Instagrammable spots in Bali, with another one being the nearby gates to the Handara Golf Resort. Both the Munduk swing twin lake viewpoint and the gates at Handara Golf Course Resort are extremely popular spots to visit in Bali in order to get picture perfect shots for Instagram. 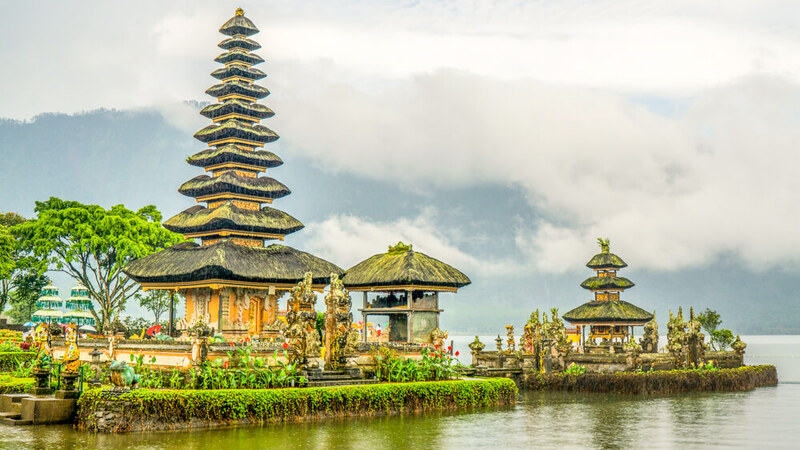 Pura Ulun Danu Bratan Temple – The iconic Pura Ulun Danu Bratan temple, situated on the shores of Lake Bratan, is one of the most well known landmarks in Bali. It’s a truly beautiful place, thanks to the temple’s peaceful setting amongst nature. Although you cannot go inside the temple, it’s still a wonderful place to visit and is located around a 30-minute drive away from Munduk. The entrance fee to visit the Pura Ulun Danu Bratan temple is 50,000 Rupiah per person. 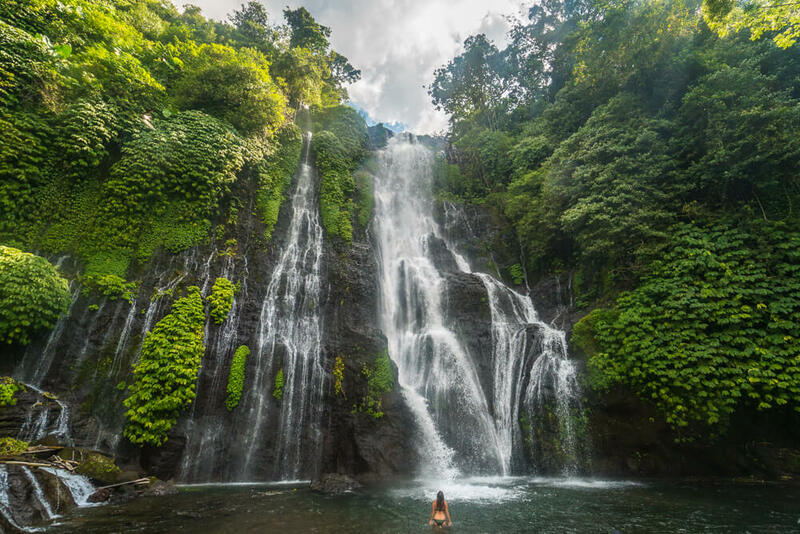 Sekumpul waterfall – Another incredible place to visit in North Bali is Sekumpul waterfall, located around an hour’s drive away from Munduk. The hike down to this waterfall is hard work but it’s well worth it to see this beautiful, towering waterfall. The best way to visit Sekumpul waterfall from Munduk is as part of a day trip, potentially combined with visiting Banyumala waterfall, Pura Ulun Danu Bratan temple and some other spots. Click here to check out our guide to visiting Sekumpul waterfall! Banyumala twin waterfall – The beautiful Banyumala twin waterfall is a brilliant spot to visit from Munduk. 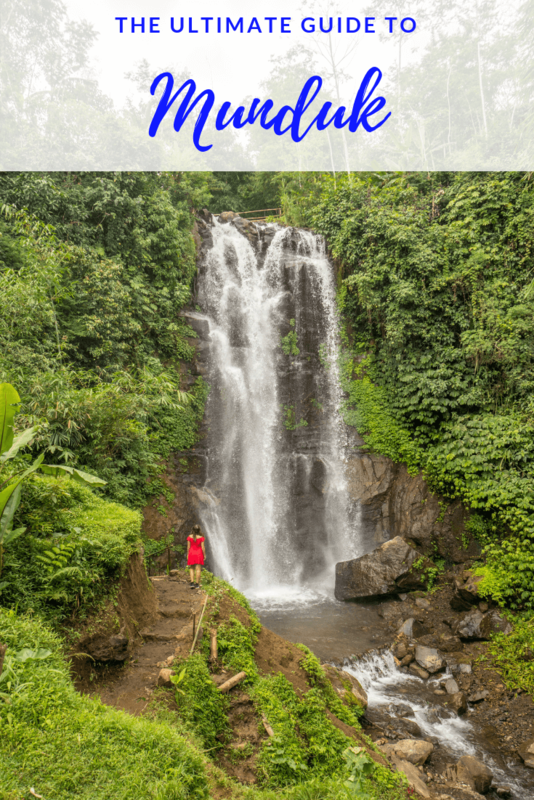 It’s one of the most stunning waterfalls we saw in Bali, and thankfully is relatively free from crowds of tourists. Part of the reason it’s less busy is because of the poor road condition leading to the waterfall. We wouldn’t recommend riding a bike/scooter on the road, but you won’t have any problems if you visit by taxi. Click here to read our guide on visiting the Banyumala twin waterfall! To get to Munduk from Ubud you can either take a shuttle or a taxi. A shuttle from Ubud should cost 150,000 Rupiah per person, although if there are not enough people travelling to Munduk on the same day then the shuttle may not be running. If you’re willing to spend a bit more, the other option is to take a taxi. It’s not possible to specify an exact price in advance, as different drivers will offer different rates. Make sure to negotiate with drivers as they will try and charge as much as they can. Realistically a taxi between Ubud and Munduk shouldn’t cost more than 400,000 Rupiah. While it is possible to visit Munduk on a day trip from Ubud, the journey time is approximately 2 hours so it’s a better idea to at least stay a few nights to see the area properly! 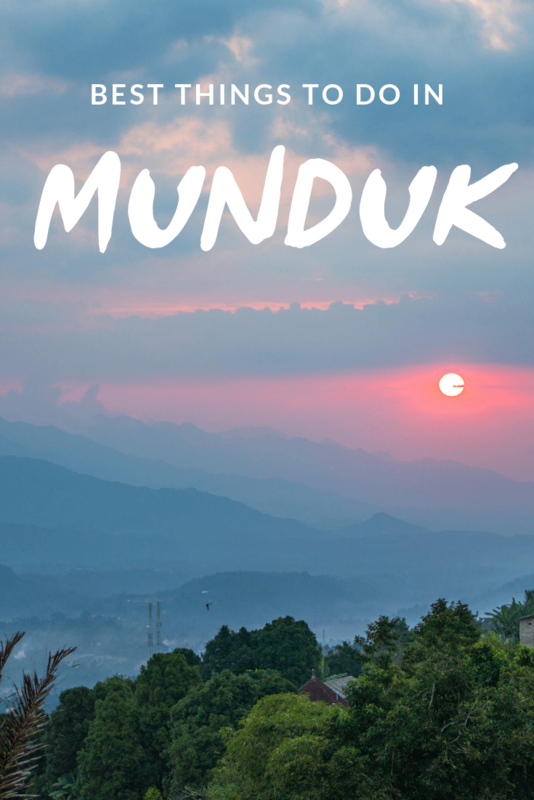 To get to Munduk from Canggu you will need to arrange a taxi. As Canggu is popular with expats, taxis generally cost more from the area. The journey time from Canggu to Munduk is also 2 hours, but taxis cost around 500,000 Rupiah one-way. We recommend using Grab if you’re looking for cheaper transport. Grab is commonplace in Asia and is similar to Uber, so you’ll need to use Wifi or mobile data to order a taxi. The taxi mafia in Bali don’t like people using online taxis as they offer significantly cheaper fares. Once you set your pick up location and destination you will be given a price for your journey. Your driver will probably send you a message with instructions of where to meet them in order to avoid angry local taxi drivers. To get to Munduk from Lovina you need to take a taxi. This should cost around 250,000 Rupiah, although the drivers on the street will try to charge much more than this. We recommend finding a driver online and negotiating a price via Whatsapp. The driver we used can be found at 007 transport Bali, so that’s a good place to start! You can also try using Grab from Lovina to Munduk if you’re struggling to find a reasonably priced taxi. Munduk is a small place, so it’s easy to get around the village itself on foot. If you’re planning to explore the surrounding area then you can either rent a scooter or get a taxi. To rent a scooter or get a taxi ask at your accommodation or one of the local restaurants. We recommend asking at Warung Made as the owner is extremely friendly and helpful. Prices for renting a scooter for a day in Munduk start from around 40,000 Rupiah. The cost of a taxi will vary depending on where you visit so make sure to negotiate a fair price in advance. The weather in Munduk is different to other parts of Bali. As the village is at an altitude of around 800-900 metres above sea level, it tends to rain more in the area. Even during the dry season it’s not uncommon for it to rain, but it usually doesn’t last for more than an hour or two. 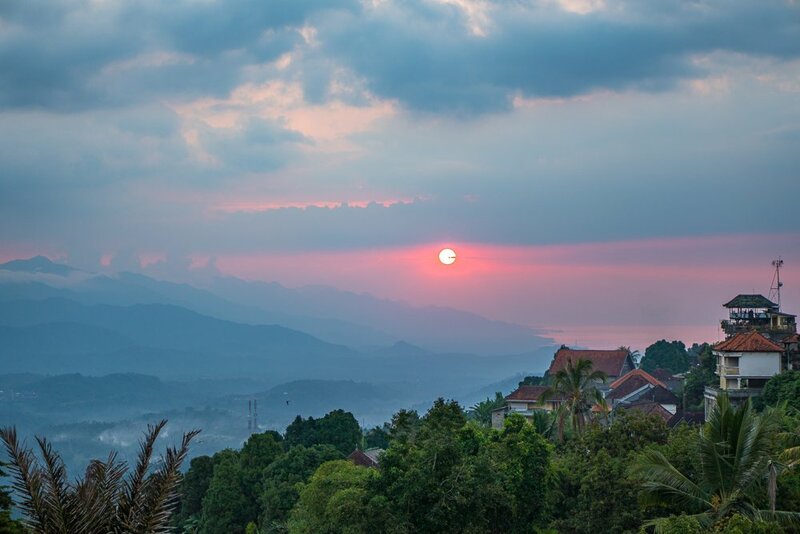 Due to the higher altitude, the area has a cooler climate than other parts of Bali. The best time to visit Munduk is between April and September, as these months see the least rainfall. Avoid visiting between December and March if possible, as this is the rainiest time of year in Munduk. If you’re looking for good budget accommodation in Munduk, then Adila Warung and Homestay is a great option. The property has fantastic views of the mountains as well as a swimming pool – making it incredible value for a budget option. On top of that, the staff are extremely friendly and are more than happy to help plan what things to do during your stay in Munduk. Rooms start from around $19 USD (290,000 Rupiah) per night, with breakfast included in the price. Click here to see the latest prices at Adila Warung and Homestay! Well located in Munduk village, Pondok Asri Homestay is a great budget option All rooms come with private bathrooms and there’s also a warung onsite that provides Balinese and Indonesian cuisine. Like many places in Bali, the staff are very friendly so will help with anything they can. Rooms start from $12 USD (182,000 Rupiah) per night, with breakfast included in the price. Click here to take a look at the lovely Pondok Asri Homestay Munduk! Situated around a 20-30 minute walk from Munduk Village, the Swar Bali Resort is a luxury option at a reasonable price. One of the great things about staying here is that there is a fan in the rooms – which can be needed as it can still get quite warm in Munduk. It’s an extremely peaceful place to stay due to the location just outside the village. Rooms start at $34 USD (521,000 Rupiah) per night, with breakfast included in the price! Click here to see the latest prices for a stay at the Swar Bali Resort! Although the Lesong Hotel is a 10-minute drive from Munduk village, it’s still a brilliant option. As the property is further from the village it’s in an idyllic setting, surrounded by rice terraces and mountains. It’s the beautiful setting that makes this one of the best hotels to stay in when visiting Munduk, Bali. Rooms start at $40 USD (612,000 Rupiah) per night! Click here to see the latest prices at the Lesong Hotel! Luxury accommodation in Munduk and Bali doesn’t come much better then this. Located outside of Munduk village, the Munduk Moding Plantation has one of the best infinity pools in Bali. You certainly won’t find a better infinity pool anywhere else in Munduk village. This spacious property boasts an on-site spa as well as producing their own locally made coffee. Prices for a stay at this beautiful property start at $155 USD (2,351,000 Rupiah) per night. Click here to see the latest price for a luxurious stay at the Munduk Moding Plantation! Warung Made – This was one of our favourite places to eat in Munduk. Warung Made serves up a variety of local Balinese dishes, whilst offering beautiful views of the countryside. The owner and his wife were incredibly helpful and kind to us during our stay. They also offer tours and treks in Munduk if you’re looking to book some activities during your stay. Warung Classic – Warung Classic is the spot to be for sunset. You can see the coast from here, as well as the layers of mountains in the distance. Personally we preferred the food at Warung Made, but it was still good and it’s well worth going just for the view! Eco Café 2 – If you do the Munduk Waterfall trek, you’ll come across this restaurant. Located at golden valley or Munduk waterfall, the restaurant overlooks the waterfall. Not only is the view amazing but so is the food! It’s well worth stopping here for something to eat after the hike. Like this guide to the things to do in Munduk, Bali? Pin it!